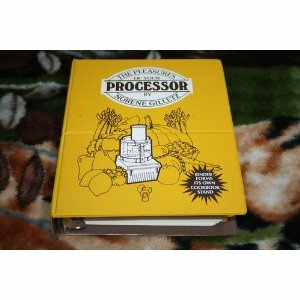 Posted on January 25, 2013 by Michele D.
I looked up the cookbook on amazon.com and it was published in 1982 so it has been around for a while yet somehow the picture of the food processor on the cover looks just like my food processor. Hmmm, I wonder what that says about my small appliances? It looks like a cool cookbook but I will admit to not being a big fan of the food processor. It’s a pain to pull out of the cabinet and even more of a pain to clean, but I’m planning to look thru the recipes this weekend and see what I can find to cook. My MIL says it includes some awesome recipes. Do any of you have this cookbook? If so, what are your thoughts? Would you give it a thumbs up? Happy Kosher Treif Cooking and Food Processing! Posted on January 22, 2013 by Michele D.
A few weeks ago, I had a very busy Friday ahead of me so I was looking for an easy breezy way to cook chicken breasts for Shabbos. I found a recipe for Crock Pot Chicken Breasts via cooks.com that seemed simple enough. Throw a few chicken breasts in the crock pot, pour in some sauce and let it cook all day. I was sold. 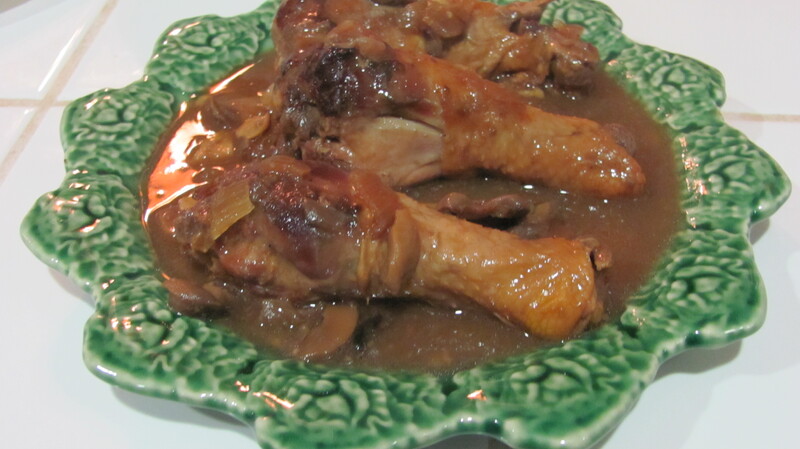 I started gathering up ingredients and quickly discovered that I didn’t have a few of them (white wine, can of mushrooms) and that one in particular was not going to work with my kosher chicken dish – cream of mushroom soup. Growing up, we used cream of mushroom soup for just about everything. My mom had several recipes that called for this staple in our home – my fav being the Chicken and rice bake – but I’ve yet to find a kosher cream of mushroom soup so I had to do some substituting. I ended up using a Portabella Mushroom soup from Imagine instead but knew we were missing out on the creamy, delicious goodness that comes from the “dairy” side of the kitchen. Layer chicken breasts in bottom of crock pot. Salt and pepper to taste. Combine soup, broth and wine (and pareve Rich Whip). Bring to a rapid boil and pour over chicken. Drain mushrooms and put on top. Add garlic and onions. Set Crock-Pot on high for 30 minutes; reduce heat to low (not keep warm) and cook for 7 to 9 hours. Stir before serving. I served over rice and the chicken legs really were delicious. The chicken melt was so tender that it just fell off the bone. I’m going to give it a whirl next week with Chicken breasts. Such a great taste and so easy. Enjoy! Posted on January 21, 2013 by Michele D.
Many months ago, there was an event for the “young” couples in our community. 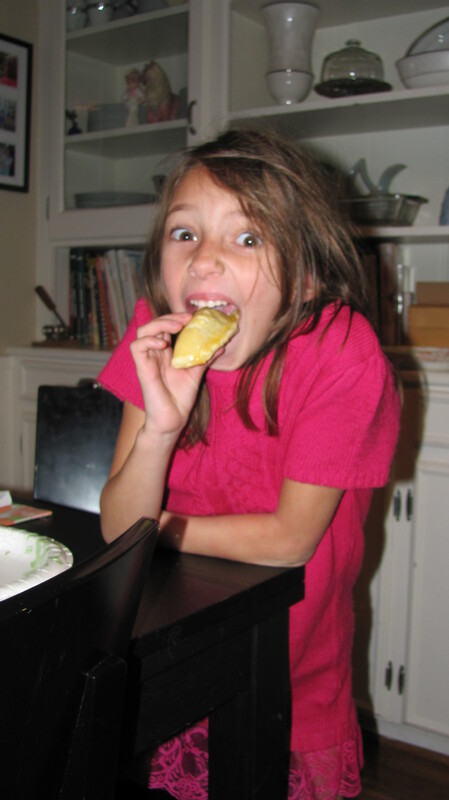 And while we aren’t really all that young anymore, the hosts of the event were serving kosher tamales and empanadas so I decided it was OK to stretch the truth (or shorten it a bit in my case) about my age … especially when tamales were involved. As a somewhat newbie to the Kosher-keeping ways, I’ll admit to having some unbelievably amazing tamales in my previous life – made with lard and pork and who knows what else and quite frankly, I miss ‘em. I was delighted by the opportunity to partake in this yummy treat once again, minus the lard and pork part. So the hubbie and I headed to the party and I didn’t waste any time filling my plate with tamales and … empanadas, which I’d never even heard of before that night. All in all, I ate way more than I should have but the kicker was that the empanadas quickly surpassed the tamales as my new favorite food. To heck with those tamales, which by the way, didn’t taste as good without the lard and pork anyway, and Hello to my new empanada friend. Pour the flour into a large bowl and make a well in the center. Add the salt, sugar, yeast and most of the warm water (I have no idea why the recipe says “most” here so I just added all of the water) and mix lightly. Stir in the softened margarine and use a fork to push the flour in from all sides and mix until a soft dough forms. Dust with flour and set aside. (I gave up on the fork and just used my (very clean) hands to mix and mash the dough). Sauté onions and garlic in oil until translucent. Add beef, salt, pepper, cumin, oregano and sauté until beef is cooked. Add aji pepper, raisins, eggs, and olives and mix until combined. Let the mixture cool. (I ended up adding more salt, pepper and garlic powder because the beef tasted a bit bland – maybe it was the lack of aji pepper – so be sure to taste-test for yourself and add more of the above if needed). Preheat oven to 350 degrees and oil cookie sheets. Pinch off a fistful of dough and roll it out flat, cut with a glass and roll out a little more. Fill each round with about 1 ½ – 2 Tablespoon of filling and pinch closed and place on cookie sheet. Brush the pies with beaten egg. (I also used scissors to snip three “air holes” in the top of each pie) and cook at 350 degrees for 15 minutes or until light brown. Let cool and sprinkle with powdered sugar. Serve warm with a lime wedge. 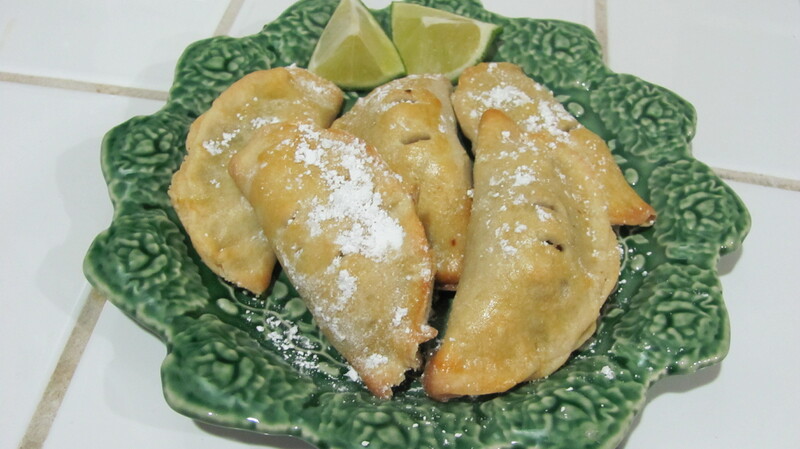 (I squeeze the lime juice on the empanadas first and then sprinkled with powdered sugar. I love them that way but the hubbie prefers them plain. Since this recipe does take a bit of time, I cooked the meat filling on one day and made the dough/empanadas the next day to spread out the work. I also ran out of dough way before meat so I’m planning to make another round of dough this week to finish off the empanadas. However, I might use my favorite Easy Peezy (pareve) Pizza bread machine dough recipe instead. I’ve used that recipe from Food.com for several things (pizza, cows in a blanket, calzone, etc.) and it always turns out great. This month is Miniatures! Follow our recipes on Twitter with #KosherRecipes.